You think your animal is doing ok, but are they? 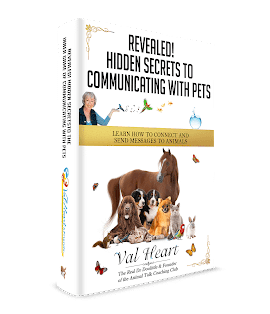 One of Val’s greatest gifts lies in her ability to communicate effectively with animals to get to the true root cause of the health problems at hand. Once you know what the real problem is and where it’s coming from, sick dogs can benefit from Val’s advanced healing methods. This can save you tons of aggravation, stress, time, energy and money over your dog’s health issues. 3. A management issue, such as inappropriate training, diet, exercise, etc. More Control Better Health Happier Lives! Val begins her work by first talking to the animal in question. Communicating with them through a health issue will make a huge difference in their ability to feel heard, acknowledged, and respected. Giving them a voice makes all the difference in the world in deepening your relationships with your animals and resolving problems. Val works with you and the animal to get questions answered, learn what is actually needed to move things forward, discover where the real issues are coming from and determine what the unknown factors are, which is critical to resolving the issue at hand. Please understand that Val is very different from other animal communicators. She specializes in problem resolution, which many animal communicators do not. She is also well versed in helping people and dogs with energetic healing, counseling, negotiating or identifying what other modalities are needed for alternative medicine or care. Blog Post: Labrador Retrievers: Signs and Symptoms of PregnancyA female dog can only become pregnant if she is bred during her heat cycle. Canine cycle, referred to as the estrous cycle, has four stages. The first stage is proestrus in which the female dog is attractive to males, but not receptive to them. This stage generally lasts six to eleven days. This stage has already ended when the dog becomes receptive to the male and will stand to be bred. Click to read the rest of the blog post.